is May 2nd so... what are you doing??? I hope you're gonna spend the day scrapping or paper crafting. There's a lot going on here at Scrap Shotz too, so if you need some inspiration check us out. Starting today and going until Sunday May 3rd is the first "Open Mic" Online Crop. That means ANYONE can post a challenge! C'mon, I know you all have wonderful challenge ideas just waiting to be posted. That's not all... there WILL be prizes! And the prizes will be for challengers AND for those who prefer to participate and not post one of their own. So why not become a member in the forum and join us for this fun and inspiring weekend. Also, Sandy and the store is holding the second annual National Scrapbook Day Crop in Calgary. There are make-n-takes, goodie bags, product and technique demos, and the store on site for some fun shopping. This year is almost sold out. There are only a few spots left. If you are interested check out all the details here. Make sure to mark your calendars for next year. We'd love to see you. For those of you who can't come to the NSD Crop in Calgary check out the store for the NSD Sale!! There are some great deals to be had for everyone!! And, for some NSD inspiration, I have a challenge to get you started. 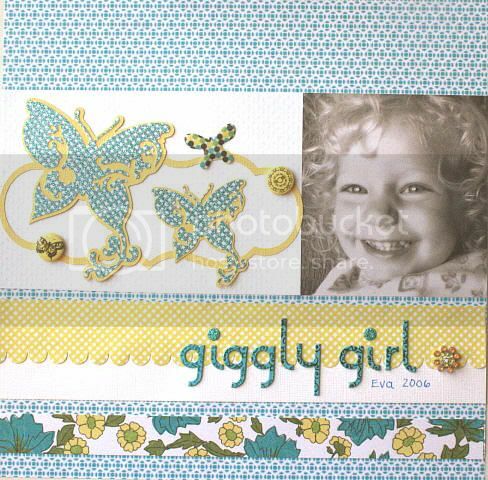 Create a layout or card using only patterned paper, no cardstock allowed. You can embellish however you like, but no cardstock. Even my handmade flowers are made from patterned paper. Hope you have a "Scrappy" weekend! Well in honor of Simple Scrapbooks' final issue... I was looking for something simple but awesome in the gallery this week. Well lucky for me Catharine (who is also a big fan of SS) did not disappoint! Be sure to check out the SSZ gallery... always full of interesting and inspiring creations! Yesterday was Earth Day but we've been celebrating all month on the forum with an avatar challenge. Now more than ever, we definitely need to do our part to help protect the earth. There are so many different ways that we can start by making small changes in our everyday lives. At times, it is so easy to feel overwhelmed with all the information and changes we can make. In our house, we've been working hard to make changes for a few years now but this year we've become even more committed to doing our part. I think one of the biggest catalysts for me was having kids and knowing that their generation will face so many challenges because of the choices we've made in the past and it made me realize just how seriously I needed to step up our efforts. This past year, I've seen more and more ideas of how we, as scrapbookers, can become more "green" and I thought this would be the perfect time to give us all a refresher on what we can do. 1. Save your scraps and use them to create cards instead of buying cards. 2. Pull our your old papers, cardstock, stamps and tools and create your own unique embellishments with them - a perfect way to make everything match on your layout. 3. 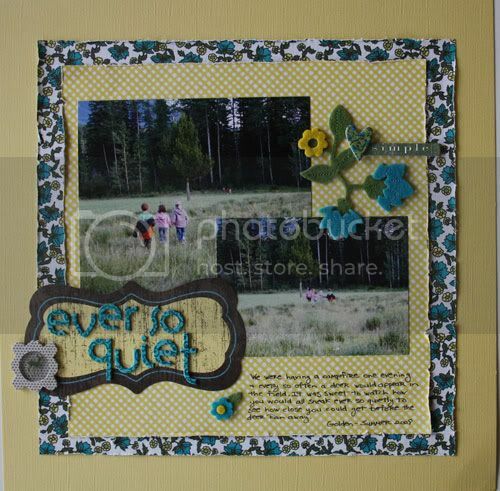 Cut images out of patterned paper and use foam squares or pop dots to give them some dimension on your layout. 4. Use tags, buttons, ribbons from clothing & gifts on your layouts instead of throwing them away. 5. Use packaging on your layouts - packages from scrapbooking supplies especially often have great designs, patterns, shapes, etc. 6. Save ticket stubs, receipts, brochures and other ephemera from vacations, concerts, movies, etc. to use on your projects. 7. Alter, alter, alter - boxes, tins, clipboards, frames - all these things can make great gifts. 8. Create photo collages with your photo editing software and save on ink and paper when you print them - instead of printing 2 4x6 photos and cropping them down to 3x4, crop them with your editing software and put 2 3x4 photos on one 4x6 canvas and print one 4x6. 9. Challenge yourself to use old supplies with new supplies. 10. Instead of throwing our your scraps, donate them to your kids' school, a church, the local childrens' hospital and finally recycle them. 11. Use cardboard from an old box on your layout as I did on mine below. 12. Scrap about your love for the earth, what you are doing to make a difference, your passion for a cause or even your love for the outdoors and the things you love to do outdoors - make sure you create a keepsake for future generations to look back on and see how important those things were to you. Please feel free to share your ideas with me too! I'd love to know what you are doing to show your love for the earth in your scrapbooking. Well I gotta say it's been a pretty quiet week in the gallery! I think everyone was getting ready for one crop or another and we'll start to see the results flowing in very soon! So it looks like the card makers have been busy despite the lull...LOL! Heather used the April kit for this stunner! Do I Or Don't I??? I am continually tempted by the luscious tools and products put out by manufacturers. Sometimes the tools are bigger and better or the papers are made with a new material or…and the list goes on and on. If you are like me, sometimes I just don’t know if I will even use the product for how I scrap or whether it is something I even want to use or most importantly for me is, can I use the tool or product in multiple ways??? For example, I had the Crop-a-dile and was very happy with this amazing tool. Then its big sister came out, the Big Bite...and after alot of thought, I am the proud owner of the Big Bite. I can't imagine not having this very practical and useful tool. So how do you decide? What do you do? For myself, I like to read reviews and testimonials of the tools and products. But the reviews need to be factual and objective at the same time. 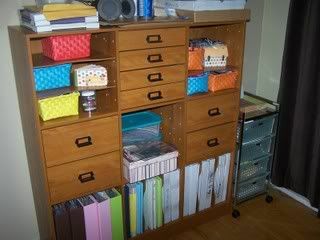 The two sites that I frequent for information are Craft Critique and The Scrap Review. 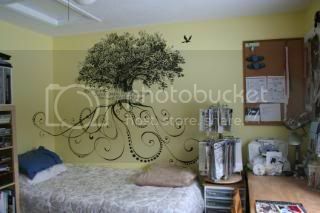 For example, I am very interested in the Silhouette. I have read all your kudos for this product and seen its work but it is a big chunk of change. I did some digging and found this very helpful article here. These two websites have helped me make my decision on the Cuttlebug and Spellbinders and a few other tools...I hope they can help you too! I'm in the mood for fun!!! There's nothing like a cute kid and some fun colors to really lift your spirits! This layout of Lorraine's just makes me smile...I'd love to see your fun layouts too! 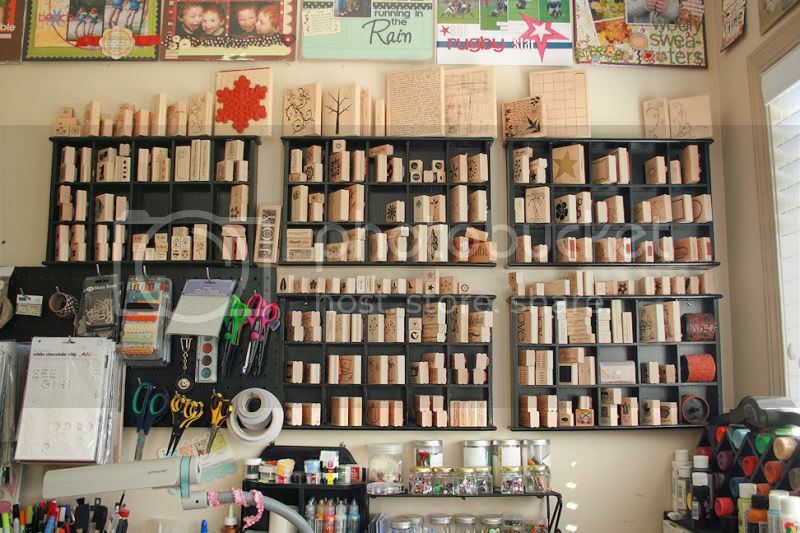 And don't you just love the way Debby has repurposed spoon shelves as stamp storage? Have a fantastic weekend, and happy scrappin'! It's time once again to direct your attention to some of the amazing work that's been hitting our gallery! One of my favorite things about the SSZ community is the swaps. Card kit swaps have been very popular so I thought I would share some of the cards that resulted from our latest Easter themed swap! Denise and Lorraine worked this kit to it's fullest! Jen and Ellen had fun with this cute bunny kit! Make sure you check out the gallery for the rest of the card reveals... and why not join in for the next swap? You won't regret it! You have got to check out The Inspired Scrapbooker. It's a great place for new ideas, tips & techniques, sketches and other great challenges throughout the month are posted. Every Friday something new is posted so you'll want to be sure to take a look. Plus there's give aways and prizes so you don't want to miss out on those!! It's also Canadian and comprised of a talented group of designers. Sonja McLean is the great mind behind the site and started it up a few months ago. 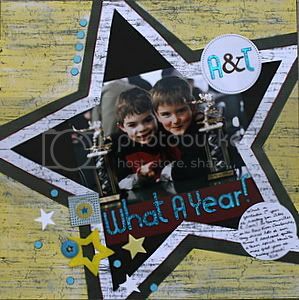 So, if you're in need of some new ideas then please make sure to pop over to The Inspired Scrapbooker. You won't be disappointed! No really, it may be April Fools Day but it is also the much anticipated Reveal Day here at Scrap Shotz. The Creative Team has really out done themselves this time with the gorgeous Fabulous Finery Kit. This is also the debut of our new Creative Team member HeatherM. Lets give her a warm welcome and make sure you stop at her gallery to see some of her wonderful creations. So, without further ado, here is some of the fabulous Creative Team Finery.